Bowyer, driver of the No. 15 Michael Waltrip Racing Toyota Camry and who grew up about 100 miles away from Kauffman, made his way to that batter’s box courtesy of Kansas Speedway and defending American League champion Kansas City Royals. And on a night at the old ballpark during which he was just going to be relaxing and munching hot dogs. Bowyer found out how civilians feel when he gives them thrill rides in fast cars from time to time at race tracks. 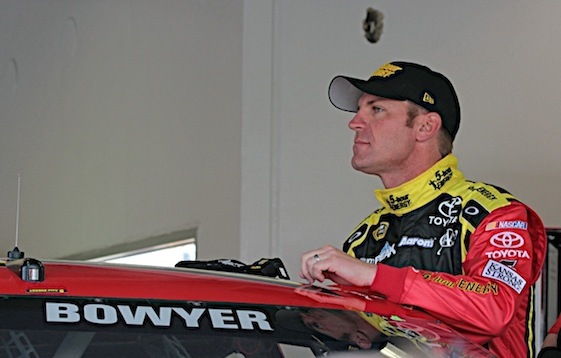 The fun will be just beginning should Bowyer win at the Kansas. And hot fun it could be. Bowyer, whose best finish in Cup at his home track was second back in 2007, said that if he wins on Saturday, he just might break out the flamethrower that was given to him as a gift when his baby was born last September. With half – or more – of the population of Emporia at the Speedway for the race, Bowyer will have no shortage of people to celebrate with if he wins. Trophies are nice, large paychecks are better but for Dale Earnhardt Jr., the relief that comes from winning a Sprint Cup Series race may be the biggest perk of all. On Friday morning at Kansas Speedway, Earnhardt Jr. was asked about the outpouring of emotions that resulted from the victory he posted last weekend at Talladega Superspeedway. He said the emotion No. 1 was relief but for an interesting reason. The victory likely put him in the year-ending, 10-race, 16-driver Chase for the NASCAR Sprint Cup Championship and in doing so, it will allow him to continue his love affair with the actual racing of stock cars. The kind of fun that can get pushed to the sidelines when racing becomes a bill-paying job. Technically, Saturday night’s SpongeBob SquarePants 400, will not be Erik Jones’ first in the NASCAR Sprint Cup Series. But emotionally? It kind of is. Jones’ first Cup drive came at Bristol Motor Speedway a couple weeks ago. But because of the circumstances of that ride – he was put into the No. 11 Joe Gibbs Racing Toyota after regular driver Denny Hamlin suffered back spasms early in the race and got out of the car during a rain delay – Jones didn’t get the full-force experience associated with most first races. That is, he didn’t have time to freak out. “Bristol,” Jones, who was watching the race on TV at home before getting a call from JGR and jumping on the team’s private jet, said Friday, “really and honestly I didn’t have time to think about it so it wasn’t much different” than getting into his car in the XFINITY and Camping World Truck series. Jones will get the full Cup-debut experience this weekend. He has known for weeks that he would be in the seat of the No. 18 JGR Toyota, taking the place of injured Kyle Busch. While he said, no, he’s not freaking out, Jones did admit that there is an edge to the situation that was not present at Bristol. Jones finished 26th at Bristol. He will be racing in both the Camping World Truck Series Toyota Tundra 250 and the Cup race. Jones will be doing so at a track that he is visiting for the first time ever. Preparation has been by using his eyes and his ears. Kansas Speedway, site of Saturday night’s SpongeBob SquarePants 400, has to be considered a Jeff Gordon track. The Hendrick Motorsports driver with four Sprint Cup championship trophies decorating his den won the first two races (2001, 2002) held at the 1.5-mile oval located on the far west side of Kansas City. Then, a year ago, Gordon won for a third time at Kansas. He also has seven other top-5 finishes and an average finish of 10th in his 18 starts at Kansas. On Friday, Gordon, who has said 2015 will be his final season as a full-time Sprint Cup driver, was asked where the Kansas intermediate sits on his list of favorite venues.